Turkey's sunny climate, wonderful beaches and sparkling sea make it a very attractive destination for a relaxing beach holiday and then there's the many amazing ancient ruins to explore, and delicious Mediterranean cuisine to try. Find your dream villa in Marmaris, a big self-catering apartment in Bodrum, a large holiday home in Fethiye, or a guesthouse in Istanbul or browse our many other big holiday properties in Turkey, all sleeping 10+, and ideal for big families and groups who want to stay together. Every region offers something special, and with our selection of large holiday houses you can find the perfect group accommodation in Turkey's popular Aegean and Mediterranean regions, as well as in areas that are more off the beaten track such as the Black Sea region, Central Anatolia, Marmara, and even Southeastern and Eastern Anatolia. IAM is a large centre in a beautiful setting surrounded by pine trees, overlooking one of the numerous bays. It provides 54 sleeps, studios, amphitheatre and excellent cuisine. Imagine staying in a beautiful big villa in Marmaris or Dalyan; a coastal holiday cottage in Fethiye; a spacious holiday home in Kas or Kalkan Town; or a guesthouse in Istanbul. At Group Accommodation, we work hard to fulfill these dreams, and as a specialist group holiday company we are dedicated to bringing you the best big group holiday homes in Turkey. 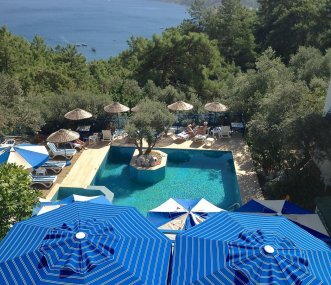 It's not easy choosing where to stay in Turkey, with such a fabulous range of beach resorts, historical attractions, beautiful rural landscapes and excellent group holiday accommodation. In the Aegean region of Western Turkey you can hire a big villa in Bodrum, rent a large holiday apartment in lively Kusadasi, or find group accommodation in Dalyan, Marmaris and Fethiye. With gorgeous beaches and great restaurants, the area is packed with Greek and Roman ruins and dotted with pretty olive groves. You can visit the well-preserved Roman city of Ephesus; explore Dilek Peninsula National Park; and bathe in the white pools at famous Pamukkale cotton castle waterfalls. With its sparkling sea and pine woods, the sunny Mediterranean region known as the Turquoise Coast or Turkish Riviera is another of Turkey's top tourist destinations. Occupying the southern coastline, there are countless beaches, historic towns, and Roman ruins to discover. Stay in a big holiday villa in Fethiye, a big apartment in Dalyan, or a holiday home in Kas and you can explore Butterfly Valley; spend time in the tourist resort of Marmaris; visit Xanthos and Letoon, the ruins of the capital city of ancient Lycia, a UNESCO World Heritage Site; see the ruined Roman city of Anemurium; and take a trip to Oli deniz, Turkey's much-photographed "Blue Lagoon". Rent a holiday home in Marmara, Turkey's most urbanized region, and you can enjoy sightseeing in the magnificent city of Istanbul with its superb Byzantine and Ottoman monuments, or visit the city of Edirne; the ruins of Troy; the thermal springs, waterfalls and verdant mountains near Yalova; and the historical town of Iznik. If you like to get off the beaten track, head for one of Turkey's lesser known tourist destinations. Rent a villa near the Black Sea, a stunning region of heavily forested mountains, and you will have plenty of opportunities for outdoor activities such as trekking and rafting in a spectacular setting by the sea. Hire a holiday home in Central Anatolia to visit Turkey's capital city of Ankara; the moon-like landscapes of Cappadocia with their awesome rock formations, underground cities and rock houses; as well as seeing Hittite and Phrygian ruins. If you hire holiday accommodation in Eastern Anatolia you can discover authentic rural Turkey in the country's remote eastern part, while if you stay in group accommodation in Southeastern Anatolia you'll be surrounded by desert-like landscapes. We try to make it easier for you to decide where to stay by providing detailed property descriptions and images for every holiday home in Turkey, alongside a list of activities available nearby. Our large group holiday homes in Turkey are scattered across the country, so you can find large holiday properties in Turkey's Aegean region, Mediterranean region and Black Sea region, as well as Central Anatolia, Marmara, and even Southeastern and Eastern Anatolia. Our selection of accommodation for large groups is unrivalled, and you can be confident that we have a large holiday villa in Turkey that will suit your needs. Our impressive portfolio features large holiday villas in Turkey as well as other types of group accommodation such as guesthouses and historic buildings. Make your search for group accommodation easier by using our easy-to-use website bringing together the best big holiday villas in Turkey for you to choose from. You can browse all of the properties in Turkey using our Regional Search, or you can choose the country in our Main Search and then narrow down your results by several criteria such as location, property type, and how many the holiday villa sleeps.